Technically, Final Fantasy VII is not a perfect game. There are few odd glitches that can be found. The game also has flaws in story, cutscene videos and graphics. There are also "debatable" flaws in the story. When you return the huge materia to Bugenhaagen, Cloud is told to get the others. He then picks up his phone and calls the rest of the party, but the phone rings, even though he is using it to make the call. However, this may not be a glitch and could have been a decision made by the designers, as this sound could also be the ringing heard while Cloud waits for the party to pick up the phone on their end. If you are using Regen, open the disc tray and use a spell. The game will stop and the only thing that will happen is your health will go up. This is useful in the Weapon fights. To un-freeze, simply close the disc and resume play. This glitch can be seen in the Windows version, in the cave near Cosmo Canyon after defeating Ultimate Weapon. When failing and restarting many times from the beginning using SWITCH, you will eventually see what looks like a giant green chocobo in the first screen jumping up and down. Cloud is still visible above the graphic walking on the path which is impossible to see. The Quadra Magic materia can be obtained without a special chocobo. All you need to do is land the Highwind at the very edge of the cliff, and if you are lucky, you will end up at the bottom of the cliff, and be able to walk to the cave holding the Quadra Magic materia, without the troubles of raising a chocobo. The W-Item materia has a flaw. During a battle, choose to use an item you want to duplicate and pick a target. Then choose another item (the same one or another one), but don't confirm a target. Cancel it, and the first item's count increases by 1. Do this over and over to easily get 99 of any item you can use in battle - megalixirs, greens, etc. Most players think you must choose the same item for this bug to work, but that is not true, making it possible to increase items you only have one of. It has been confirmed that the W-item bug still has not been corrected in the PSN version. 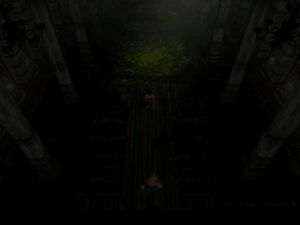 When visiting Aeris' church in the second disc or later, one can spot a "ghost" of Aeris right when entering the room. The ghost will only appear for a split second when visiting the church for the first time. Other characters can be seen appearing and disappearing mysteriously when entering an area in FF7. Due to other strange occurrences, this area may be glitchy by nature. It is actually possible to enter the church again in Disc 1, before starting to infiltrate the Shinra building and rescuing Aeris. The glitch is the same here even before she dies in the game. The effect, if intentional, is not very striking or noticeable. The model of Aeris stays there until you pass a broken bench. When you walk past the broken bench, Cloud stops moving for a second and Aeris disappears, which means an event triggered to delete the model of Aeris. The kids are suddenly surprised when Aeris is gone, saying "Hey! where did the flower lady go?". This indicates that they thought she was with them before. Get all the materia from the materia caves. Once you did pretty much everything go back to icicle inn and go to where you got the glacier map. That little cat lying on his back next to the sweet old lady will now be a large monster which is popping out of the house walls. It doesn't even look like a cat at first. If you walk into a spider web immediately after fighting a random encounter it is possible to have the ambient music play while fighting instead of the battle music. This has only been confirmed in re-release of pc version. Also confirmed to work on Final Fantasy 7 American version, running original or greatest hits version, on a ps1original, ps1compact, ps2original, ps2slim. 09/01/2015. Can be performed on all spider webs if timed correctly. (only tested in PSX version may exist in others) Anytime the game automatically places materia into your inventory like during some forced party changes if your materia inventory is too full you will lose any that do not fit for good. Just before Cloud jumps on the train, he is surrounded by Shinra Soldiers, However in the FMV cutscene, when Cloud jumps on the moving train, the Soldiers are nowhere to be seen. When the party is escaping from Shinra HQ, Tifa and Aeris steal a truck. If you look closely at the text on the side of the truck it says "Midgal" instead of "Midgar". Curiously, there are a few misspellings of this nature in Advent Children, for example, one "Midgul" sign can be seen during the Bahamut Sin fight. The most debated FMV flaw: When Sephiroth descends from the skies, he's bare-handed. When he stabs Aeris, he suddenly has gloves. When Cloud gives the Black Materia to Sephiroth, it's not black at all. Or pyramid-shaped. It's blue and round. If you go to the Gold Saucer at the beginning of Disc 2 (before Cloud recovers), there are still balloons as you enter and fireworks as you leave, even when Gold Saucer itself is closed and music isn't playing. When the Shinra rocket launches, there's a brief shot of the side of the rocket. It seems to be horizontally mirrored. If you die on the second disc, then while it's loading the main menu screen, put in the first disc and start a new game...you will not have to watch the beginning FMV sequence, and all the FMV sequences will be mixed up until the PlayStation is turned off (this hasn't been confirmed for the PC version). In the PC version, during the Fort Condor battles distinct PlayStation and buttons are displayed when interacting during the battles. In the Chocobo race event at the Gold Saucer, when selecting a Chocobo it shows and to skip through Chocobos when it should be and , but is still usable as . When Cloud and the rest of the party just jump out of the Highwind, only some characters have parachutes. Outside of the ropeway station in Corel, a sign says "Amusement Park", but it's in Greek letters. In the Nibelheim reactor, a monster breaks loose from its tank, but when the room is seen the next time, the tank is undisturbed. Sister Ray has its name painted on its side even before it is moved to Midgar and Scarlet gives it that name. You can see this name on the side of the cannon when Tifa escapes the gas chamber. Disc 1 ends in a scene in the house with the beds, Disc 2 begins from out door of the other house in the same screen in the Forgotten Capital. When Sephiroth (or maybe Jenova) first breaks loose from Hojo's laboratory, he goes on and stabs the President in the back, leaving the sword stuck in the body. However, Sephiroth later has his sword and how he got it back is never explained. This has lead to theories about whether or not the real Sephiroth survived when he was killed years ago, or if there were clones of Sephiroth made. The answer was briefly revealed in the movie Advent Children: when Kadaj becomes Sephiroth he is able to summon the sword out of thin air. When visiting Gongaga, you can spot Scarlet and Tseng looking for a Huge Materia. The odd thing is, you can visit the place any time after escaping from Desert Prison, or in the Disc 2. So depending on the context and time you see the cutscene they're looking for either the Black Materia or one of the four Huge Materias, even when they aren't necessarily needing them yet for anything! (Potentially foreshadowing later events) Either way, the scene isn't wrong as such, it's just ambiguous. No matter when you acquire Vincent in your party, he asks, "If I go with you will I meet Hojo?" and Cloud replies, "Dunno. But we're after him and Sephiroth. So, I guess sooner or later..." Even if you've already killed him. In Disc 1 your party obtains the Buggy land vehicle and Tiny Bronco a shot down airplane turned into a boat. But in Disc 2 after the Northern Cave events, you obtain Highwind airship, but both the Buggy and the Tiny Bronco disappear without any explanation as to who stole it or destroyed it. When Cloud is finally rescued, he apologizes about lying about his military career and never reaching SOLDIER. Yet when you go out right after that and talk to Yuffie, he rambles on and on about how he dealt with motion sickness in SOLDIER. Right before you are going to fight Diamond weapon, Yuffie asks Cloud "Are you waiting for Cloud? He's flying right now, so you can't get him." However, some attribute this discrepancy to her delusion brought on by her illness at this point in the game. After the fight with Diamond Weapon, and the Sister Ray fires, all of the glass breaks from the top floor of the Shinra Building, yet in the next cutscene, you can still see the windows. Also, the president's body isn't in the cutscene, but it is if you go to the top of the Shinra Building. The Highwind doesn't get any faster, even when Cid pulls the levers at the end of Disk 2. Note: Most of the translation bugs were fixed in the 1998 PC version. When Cloud first meets Aeris after he falls through the roof of her church, the young girl tells him he gave her a fright, since he almost fell on her. However, since Japanese being somewhat ambiguous with its lack of any personal endings for its verbs, Aeris, still referring to the church, proceeds to give Cloud a good telling-off about how scared she was when the church almost fell on her. Aeris' name is actually "Aerith." If you talk to the sick man in the slums, Aeris tells Cloud the following: "This guy are sick." The player can choose "Off course!" or "No, way!" when asked if they want to continue in the Battle Arena in Gold Saucer. Jenova's only line was a typo: "Beacause, you are... a puppet." In The Temple of the Ancients, when you get to the altar, Cait Sith will show up and Aeris will ask him to read their fortune to Cloud and Aeris before sacrificing his robot body and he will say "I'm so exited!" instead of "I'm so excited!" Fourth Bracelet (armor) is probably meant to be "Force Bracelet" considering its effects on the Magic and Magic def stats. The meaning of Orthopedic Underwear in Tifa's house during the Nibelheim flashback seems to be different from that of Japanese ver. "ちょっと背伸びパンツ" . The game lets you reconfigure the buttons on the PlayStation controller, however there are times when the game designers seem to have forgotten about this and designed the game only to work with the default button map. When maintaining your Chocobos (feeding, releasing, etc.) you have to use to confirm, regardless of what you have mapped to confirm. If you have mapped to cancel and mapped to confirm, when you are choosing options for the Chocobo, will cancel the dialog and no button will confirm. You'll have to return to the default configuration to deal with the Chocobos. When climbing the ladder in bone village during an excavation, you must use to get on the ladder, no matter which button you have assigned to confirm. Several times the game tells you to press a specific button (such as ), when in fact you need to press whatever button you have mapped to that function (in this example, whatever you have mapped to cancel). After you have received the submarine and the air ship, you can cause the game to have an error. Park the submarine at a dock, either at Junon or Costa de Sol. Land the air ship as close to the submarine as possible. Next acquire a Chocobo (if you haven't bred your own) and try to move the three items as close to each other as possible, with cloud in the middle. Enter the submarine and exit between the Chocobo and the airship. If done correctly, the submarine will move under one of the other vehicles on land, and the game confused by which vehicle you are in, and will freeze. This page has been accessed 147,809 times.